More and more we are challenged by today’s learning environment – students are different, digital tools are evolving, and instructors are continually asked to do more with less yet show greater results. With the creation of Many Europes, Choice & Chance in Western Civilization, an entirely integrated program, we recognize this changing environment and set out with the goal of better meeting the western civilization course challenges of improving student performance, critical analysis skills, and overall comprehension in a continually evolving teaching and learning environment. What does it mean – integrated program? Rather than a traditional narrative text that then has ancillary support material or supplements tacked onto it, Many Europes was constructed as a program. Each narrative section has clearly stated learning objectives that are tied to the digital tools which drive the program’s assessment. A key tool in driving knowledge is McGraw-Hill’s LearnSmart, an adaptive assessment tool, which has proven results of increasing student comprehension and overall course results. Yet, we realize that while history instructors want students to know basic historical facts, the actual goal of the course is improving student’s critical thinking abilities. Our Critical Missions develop analysis skills through the examination of maps, primary sources and the completion of a written argument. In addition, several other assignment types within McGraw-Hill’s Connect drive the development of analysis skills and are also tied directly to learning objectives. What do we mean by Choice? Unique to this program, Many Europes discusses European history as a series of choices within a set of historical circumstances, driving greater critical analysis as students realize that Europe's fate was never inevitable but instead was created by individuals with diverse voices and perspectives. Choice also means flexibility. Many Europes’ flexible content including a customizable documents collection available as print or digital as well as many user options from a completely digital experience to a hybrid print and digital experience, or if you must, an all print experience. What do we mean by Chance? In history chance shows itself as a dropped letter, an unexpected storm, or surprise turn of events. Chance can also show itself as a new way, path, or direction that allows for the anticipation and expectation of something better. Many Europes’ flexible content coupled with powerful digital learning tools and a customizable documents collection gives users an innovative choice for the teaching and learning of Western Civilization as well as a better chance for improved student results and course outcomes. LearnSmart is the premier learning system designed to effectively assess a student's knowledge of course content through a series of adaptive questions, intelligently pinpointing concepts the student does not understand and mapping out a personalized study plan for success. LearnSmart prepares students, allowing instructors to focus valuable class time on higher-level concepts. SmartBook - The first and only adaptive reading and learning experience. SmartBook is changing the way students read. It creates a personalized, interactive reading experience like no other by highlighting important concepts, while helping students identify their strengths and weaknesses. As a student reads, the reading experience continuously adapts by highlighting content based on what each student knows and doesn’t know. This ensures that he or she is focused on the content needed to close specific knowledge gaps, while it simultaneously promotes long-term learning. How to Analyze a Primary Source is a brief, illustrated tutorial on how to read and analyze a primary source which can be bound into the text or assigned in Connect History. In Connect History the tutorial is a video activity. As students watch, they are prompted at various points in order to confirm understanding. Over 130 primary sources specifically tailored to this program are available through McGraw-Hill Create. Every chapter has 8 to 10 additional sources selected by the author team. Each selection has an introduction and concluding critical thinking questions. These sources can be bound into the text or used to create a separate reader. All these primary sources and questions are also available in Connect History as digitally assignable and assessable activities. The themes of Choice and Chance reflects the fundamental conviction that people make history through their choices. Students engage best with history when they recognize that real human beings, whether in ancient Rome or Nazi Germany, had to make difficult decisions while caught up in turbulent times, with a limited set of ideas and options available. Unlike choice, chance intrudes—often in the form of external events like dramatic weather, economic downturns, and pandemic diseases. Chance matters as much as choice in shaping history. 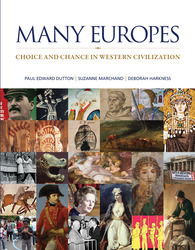 Why the title "Many Europes"? In historical terms, there never was a “single” Europe. The history of the European continent has always been one of many diverse peoples striving for identity. This diversity explains a great deal about the dynamic nature of the history of Western civilization. Emphasis on the “lived experience” - Students can better understand the choices made by individuals when we help them think themselves back into historical and cultural contexts—what it was like to be a Roman senator, an English peasant after the Norman Conquest, or a Victorian scullery maid. We can engage students in history by showing them how fascinating these stories are and why they still matter today, rather than overwhelming them with endless detail. Inclusion of “Big Europe.” Too many Western civilization programs focus almost exclusively on Britain, France, and Germany. Many Europes integrates the vitally important, fascinating, and often blood-spattered histories of southern, central, and eastern Europe. Naturally, also included are those civilizations—Egypt, the Islamic Empire--that have always been part of the curriculum because of their profound impact on Western civilization. Reduced number of chapters - In order to make it easier for instructors to cover the course material, the number of chapters has been reduced from thirty to twenty-six. Combined is the material usually divided between chapters on the Industrial Revolution and on nation-building to emphasize the simultaneity of the two processes throughout most of Europe. Room is left at the end of the book for a chapter on Europe since 1989 culminating with the current Eurocrisis. Multiple eBook Formats--This title is available in eBook format within Connect Plus, SmartBook, CourseSmart, and from Amazon for Kindle. NEW Access to Primary Sources through Connect History – Connect History’s Image Bank allows users easy and quick access to hundreds of additional primary sources. Each source can be downloaded and incorporated into presentation or assessment materials. Paul Edward Dutton is a Fellow of the Royal Society of Canada and of The Medieval Academy of America, and the Jack and Nancy Farley University Professor in History at Simon Fraser University. He holds a Ph.D. from the University of Toronto and a doctorate in medieval studies from the Pontifical Institute of Mediaeval Studies (P.I.M.S.). Among his books are The Politics of Dreaming in the Carolingian Empire, Charlemagne's Mustache and Other Cultural Clusters of A Dark Age, The Poetry and Paintings of the First Bible of Charles the Bald (with Herbert Kessler), and The Autograph of Eriugena (with Edouard Jeauneau). He is the general editor of three series of medieval studies at the University of Toronto Press and the critical editor of two Latin texts from the twelfth century. Suzanne Marchand obtained her BA from UC Berkeley (1984) and her MA and Ph.D. from the University of Chicago (1986; 1992). She then taught for several years at Princeton (1991-99), where she received tenure. In 1999, she moved to LSU in Baton Rouge where she is Professor of Modern European Intellectual History. Her specialties are Modern German and Austrian Intellectual History, the history of classical scholarship, the history of cultural institutions (museums, universities, etc), the history of archaeology, and the history of aesthetic thought. She has published two books, Down from Olympus: Archaeology and Philhellenism in Germany (Princeton University Press, 1996), and German Orientalism in the Age of Empire: Religion, Race and Scholarship (Cambridge University Press, 2009). She has also coauthored an innovative and successful textbook on world history (Worlds Together, Worlds Apart, published by W. W. Norton), edited two volumes of essays (Proof and Persuasion: Essays on Authority, Objectivity, and Evidence, with Elizabeth Lunbeck; and Germany at the Fin de Siecle, with David Lindenfeld), and written numerous other shorter pieces. She has two children, Charles (14) and Henry (11); her husband, Victor Stater, is an historian of early modern Britain, and chair of the history department at LSU.